A lot of times when our kids don't do well in school, we think that they need more tuition or more assessment books. However, research is now showing (and justifying what I have believed all along) that school performance is more than just brain power. Peers, which refers to children who are of the same age or intellectual level, play a very important part in how well your child does in school. If you think about it, it makes sense. When I was Primary 5 or 6, I remember spending many afternoons after school with my friends doing homework. I didn't do it because I liked homework (definitely not! ); I did it because I wanted to be with my friends. We helped each other when the other didn't know how to solve a Mathematics problem and tested each other's memory of the information in the textbook. In order to have friends, one has to be accepted by peers. In psychology, Peer Acceptance refers to the "likability" of a child or the extent by which other children want to play with the child. The way that researchers determined peer acceptance (i.e. the likability of each child) in the class was by asking them to list 3 classmates that they liked and 3 classmates that they disliked. The researchers then drew on a graph and linked the children to each other based on the children's answers. For example, if John listed Alice, Gabriel and Tom as the classmates he liked, then 3 red arrows will be drawn from him to them. Grey arrows were used in the same way for classmates that he disliked. These four broad categories of children are summarised in the infographic below. A lot of the time, the common practice in most schools is removing a child whenever he/she does not behave in the class or can't get along with his/her classmates. This is not recommended as this may further increase the peer rejection. 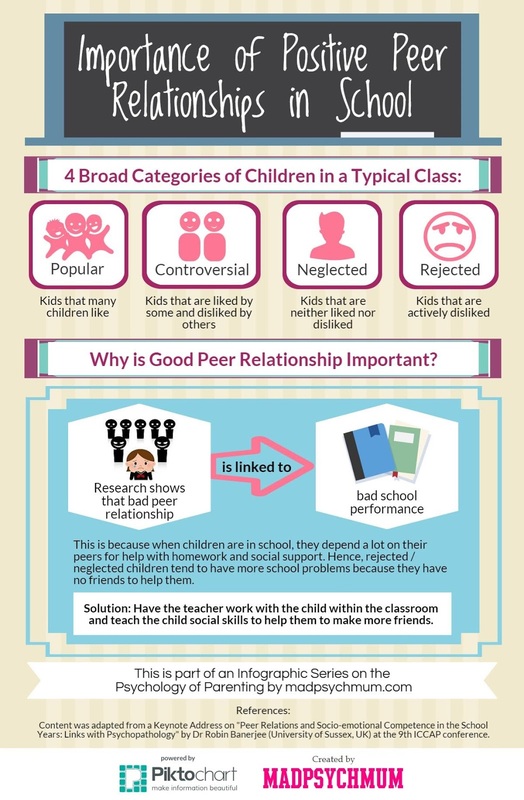 Instead, researchers suggest that teachers work with the child within the classroom by teaching the child social skills to help him/her to improve their peer relationships and teaching the other children (especially the popular children) to be accepting and not isolate/reject others.